I posted this dress on one my eco printing group, and fellow members have asked me to share the pattern. And I’d promised them that I would…so here it is. I bought a similar looking dress in Korea while I was there on vacation 3 years ago. It has 2 pockets in the front, and the sides are cut at a deeper angle giving the front a more rounded edge. I traced the outline of the dress and modified the design. 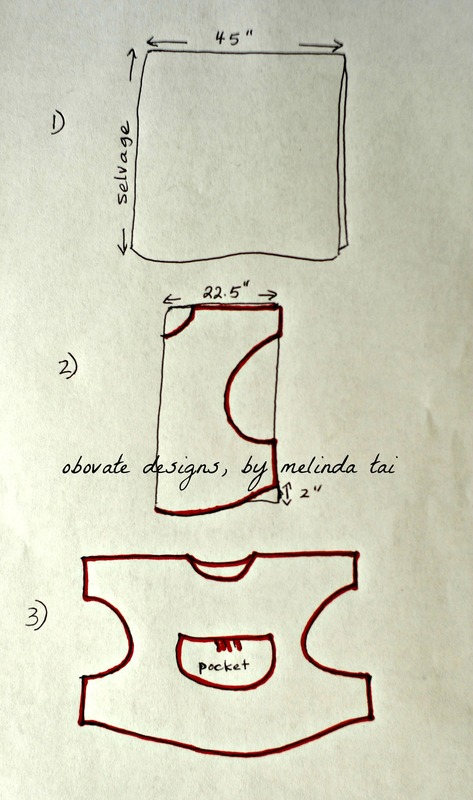 This pattern is based upon my measurements, and you can add/subtract to your appropriate size. Materials: 2 yards of a 45” wide raw silk, folded in half (selvage on the both sides), and then half again. Follow the chart below for a rough idea. The cutouts on the sides can be used as pockets; you can also make some pleats on the pocket. Simply sew the shoulders, sides, and hem the neckline–voila a 3-hole dress in a jiffy! Let me know if you still have questions and I love to see your version of this dress. *Unauthorized use and/or duplication of this material without express and written permission from this blog’s author and/or owner is strictly prohibited. Excerpts and links may be used, provided that full and clear credit is given to Melinda Tai and Obovate Designs with appropriate and specific direction to the original content. Thank you for visiting, I welcome all your comments.